I’m not quite sure what happened to the Yamaha mouthpiece that came with my clarinet. I know I still have it. But I think it might be in a case somewhere from one of my other clarinets (I have a ton of cheap, used, old ebay models I was going to refurbish), and at some time I got it in my head that I needed a new one to play “better”. So I got a good, basic student mouthpiece. 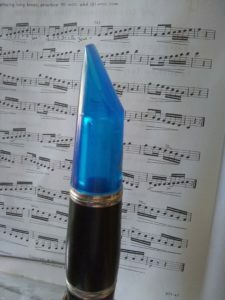 Then, I found a Gigliotti blue plastic mouthpiece on eBay. It was pretty! I really needed that one. So I bought it and put it in a box…and there it stayed for years. Until now. Determined to really be serious about this, and also play what I have, I got the blue mouthpiece out. I used a leather band ligiture rather than a metal one, and oh my goodness, immediately I sounded a thousand times better. I played notes a million times better, and I am in love. Like swoony, oh we could dance all night, cue the movie montage… IN LOVE. Here it is on my Yamaha wooden clarinet I’ve had since the fifth grade (1987). Isn’t it pretty? I’d already realized that I really really love the D’Addario Reserve reeds that I mentioned I was breaking in (though LaVoz comes a close second…sorry Rico and Vandoren), and when I put that together, it is beautiful, sweet music. I just got a clear one and a red one today. I might be a little addicted, because I also still need the amber one. And yes, they will be working into my stories. I really didn’t know what a difference a mouthpiece could make. Now, I do, and I don’t think I’ll be looking back.